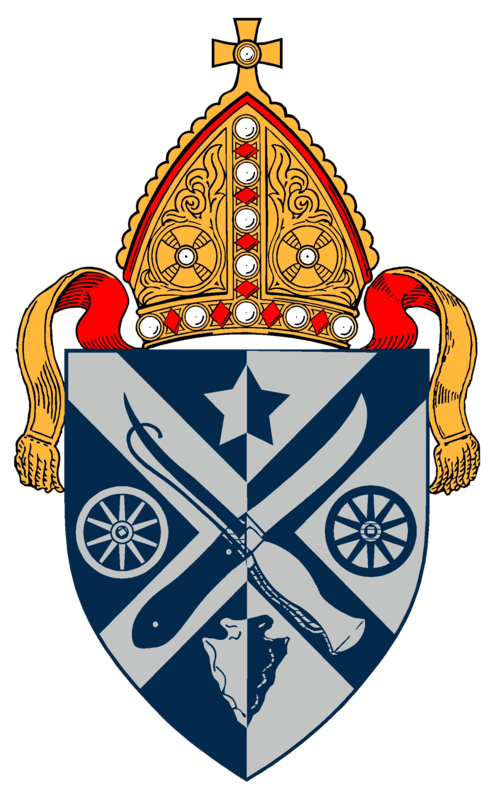 Over the course of the next few months the Search Committee will be listening to what the people of the diocese have to say about the gifts, strengths and experience our next Bishop should have, and also to their opinions about the goals the new Bishop should have as they prepare to lead our diocese. We need to know what you think. As such we will be conducting a Survey (this can be completed online or by mail) of the people of the diocese and organizing Listening Sessions around the diocese to hear your thoughts on our new Bishop. The Bishop is the spiritual leader of the diocese. Bishops preserve the faith, they encourage unity and they strengthen the church. Bishops dream big dreams for the church and lead the church in a healthy direction. They ordain priests and deacons to help them in their task, and they coordinate the work of laity. They are strategic thinkers, good administrators and strong teachers and preachers. They represent the church to the world. The goal of the Search Committee is - with God’s help - to find three to five good candidates to stand for election as our next Bishop. To ensure a smooth transition, our next Bishop will begin their ministry among us as a Bishop Coadjutor. This means the new Bishop will serve alongside Bishop Ed for a short period of time. 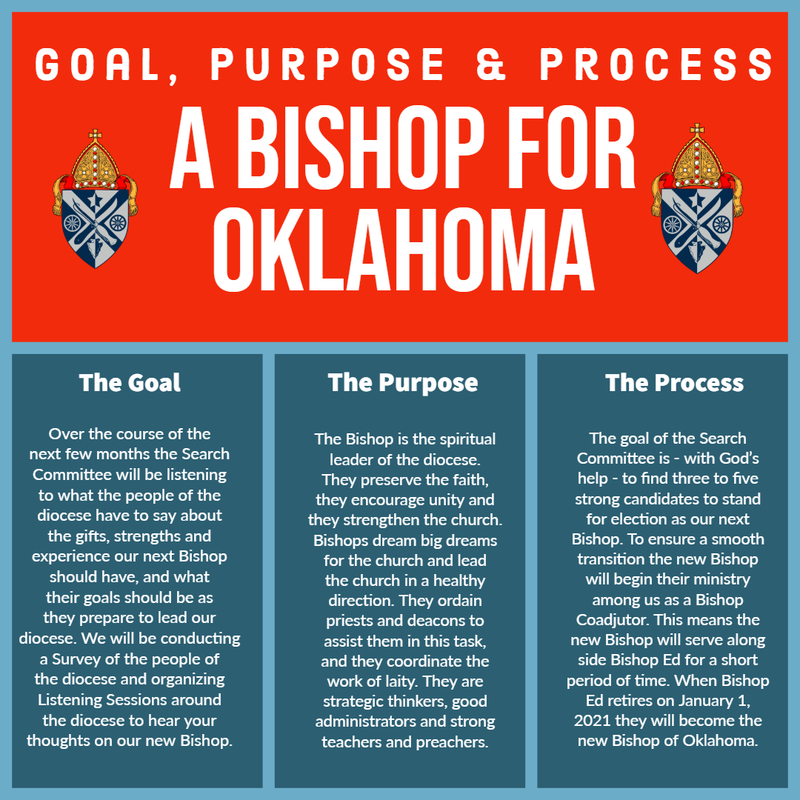 When Bishop Ed retires on January 1, 2021, they will become the new Bishop of Oklahoma. 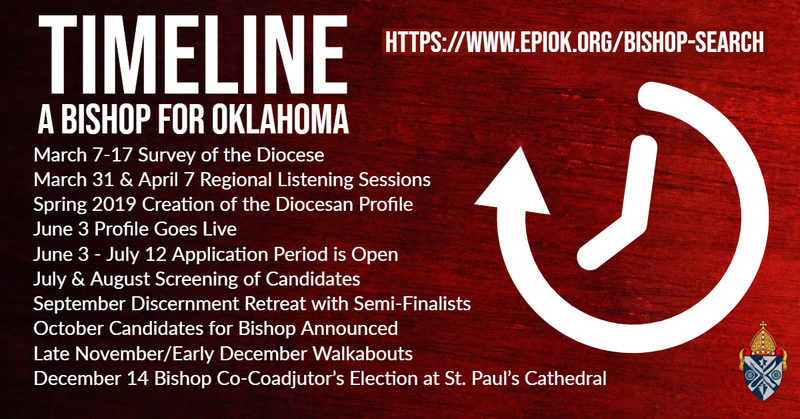 Gracious God, you call each of us to ministries of love and service for your people: Guide each person who will help choose the next bishop for your flock in the Episcopal Diocese of Oklahoma. Give the gift of discernment to the nominating committee and the standing committee, that they may wisely choose candidates who would fill the role of bishop with honor and grace. Awake in each person who may be called to apply to become our bishop a sense of true searching and humble submission to your will. Inspire every voter to enter the discernment process prayerfully and carefully, that our next bishop may lead this diocese to answer your call. We pray this in the name of your Son, Jesus Christ our Lord. Amen. Holy Father, we give thanks for the ministry of Bishop Ed and Debbie in the Diocese of Oklahoma. For the love they have given our church, for the relationships we have built with them, and for the mission we have shared together, we offer our gratitude. As they enter a new season of life, fill them with your grace, that each new day may be holy and grace-filled, and that they may find that this transition brings them joy, peace, and fulfillment. All this we ask in the name of your Son, Jesus Christ our Lord. Amen.